Reduce your lighting costs by 50%. 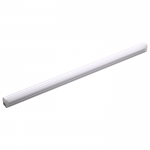 The ENSA™ LED T8 tube light series are a highly efficient fluorescent tube replacement that deliver better quality & longer lasting light and do not fade or flicker. Available in 18W (1200mm) and 22W (1500mm) and the PIR motion sensor series is available in 9W (600mm) and 18W (1200mm). The ENSA™ LED 13W linkable strip light is available in warm and cool white and offers energy efficient lighting in a versatile, slim package. Connect three LED strip lights together for a maximum 3.5m length.